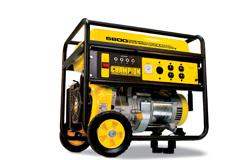 A 5500 watt generator is a tremendous asset for most people, as a back-up source of energy. Whether you're a sportsman enjoying the great outdoors, and needing to power your RV, or a homeowner living in areas prone to power outages, it may just come in handy. With the increase in inclement weather and more powerful storms that have been pounding the United States in all four seasons, a 5500 watt generator will provide you and your family with a safeguard against the weather related emergencies which are becoming all too common. There are several brands on the market, so when you are searching for a 5500 watt generator that meets your specific needs, be certain to check out the specifications on each model. This will help to ensure that you make the best selection to meet your needs. Some of the items you may want to consider are, do you need a unit that is easy to start? Can you physically pull a recoil start cord? How many outlets will you need the 5500 watt generator to have? These will help in your search. The next thing to consider is the customer reviews for the product you're considering purchasing. It's wise to check around and find out what other users have to say about the variety of brands available. The Champion 5500 watt generator is rated at 5500 watts, but has the added feature of a 6800 watts maximum output. It also includes two 120 volt duplex outlets (5-20R) and one 120/240 volt twist lock (L15-30R) outlet. This unit is powered by a Champion 338cc OHV engine with a cast iron sleeve which is CARB - California approved. It is designed to run for 11 hours on a full tank of gas at 50% load, and comes with engine oil. This particular unit comes with the easy pull recoil start feature. It weighs in at 185 pounds and is 31.3 inches in length, 20.9 inches in width and 22 inches in height. This 5500 watt generator has received reviews rating from a majority of high ratings on a scale of one to five. This is a summary of what other customers had to say about the Champion 5500 watt generator. The written directions are clear, and well written, making the 5500 watt generator easy to put together. The unit started right away, only requiring one pull and in power outage situations, electricity was available to power needed items in the house within 5 minutes without a lot of fuss. Some of the recommendations for improvement on this particular 5500 watt generator were to remove the recessed sections around the gas fill spout at the top of the tank, which would increase the capacity of this unit to hold between 7 and 8 gallons of gas. This would increase the length of time that it would run in between refills. 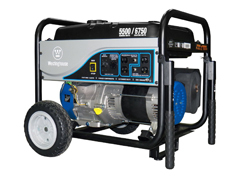 The Westinghouse WH5500 model of 5500 watt portable generator is a unit that features 6750 starting watts. Other details include quiet operation due to the Pulse Flo muffler, a simplified control center, with a 4 stroke 357cc overhead valve engine. This unit has a manual recoil start. It also comes with a full enclosure that will help protect the electrical connections from flying debris and inclement weather. It comes with 4 120-volt and 1 120/240-volt twist outlets. This 5500 watt generator is not CARB compliant so therefore is not for sale in the state of California. Customers rated with Westinghouse brand of 5500 watt generator as being easy to put together, and working efficiently. There were several comments about how much the company has improved their 5500 watt generator, such as stronger and easier to move wheel assemblies on the units, quieter running, and the full enclosures over the electrical components that make the unit safer to operate in bad weather conditions. Customers also appreciated the fuel level indicator that helped them to know when it was about time to refill the unit. Additional comments on this 5500 watt generator include that it's a great buy for the price, and a high quality product that is recommended. View more reviews on Amazon.com! There were a few items for this 5500 watt generator that some of the customers remarked about such as the unit is heavy and they recommended that the wheel assembly must be put on to ensure that the unit is moveable. Another customer remarked on the fact that it is easy to start, however; a small person may have trouble pulling the starting cord. These are items to check out if they are applicable to you, especially if you physical barriers that may make it difficult for you to start the 5500 watt generator without assistance. Whichever brand you decide to go with, a 5500 watt generator is a worthwhile asset that may come in handy. In a power outage, it could make your life much more comfortable. In the event of an emergency situation, it could even save your life. So be sure to check out the variety of available 5500 watt generators and find one that meets your unique needs. While you're at it, don't forget to check the customer reviews. Best Portable Generator Reviews: The Ultimate Generator Comparison Buying Guide!